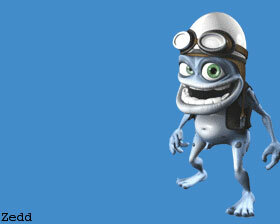 Jamster's Crazy Frog, aka the world's most annoying ringtone, is now the UK's hottest dance tune. Some crazy Germans have mixed the ringtone with the Beverly Hills Cop theme to create one of those tunes that sticks in your head until you finally jump off a bridge. Jamster is spending millions promoting the ringtone - ringtones are a much bigger deal in Europe and Asia than they are here - and a friend in the UK says this is on TV at every commercial break. Here's a link to the video. You'll love to hate it. But does anyone know why the frog has a woody? Definitely annoying, but also quite catchy. It's one of those things that is cute for about 5 seconds and then you are sick of it.